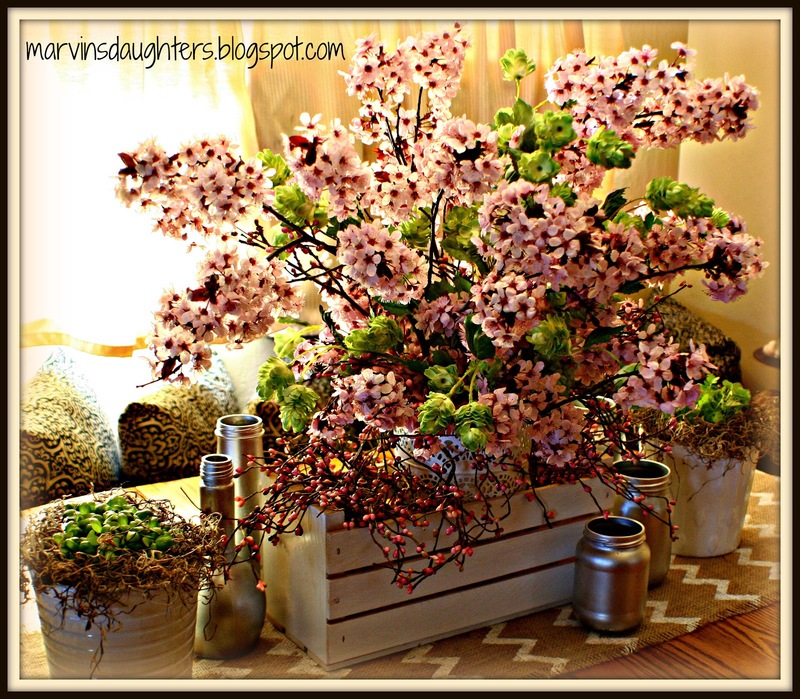 Do you ever wish you could bring some gorgeous springtime beauty inside your home? 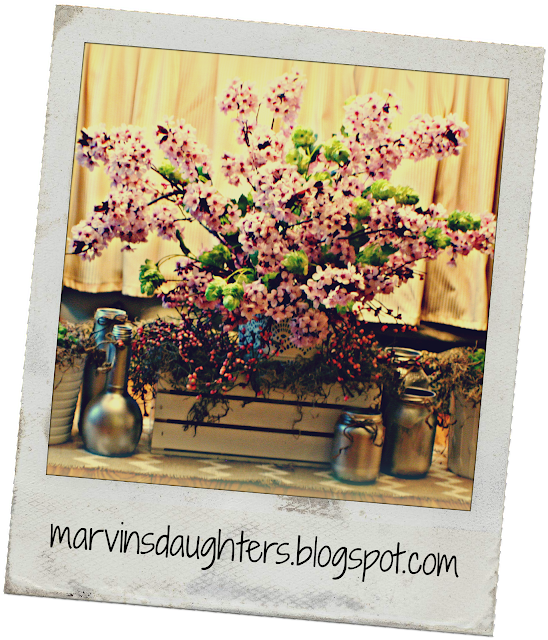 All of the beautiful blooming trees in town inspired me to create a springtime centerpiece for my kitchen table. I can honestly say that this center piece is "priceless" or rather it did not cost me a penny! 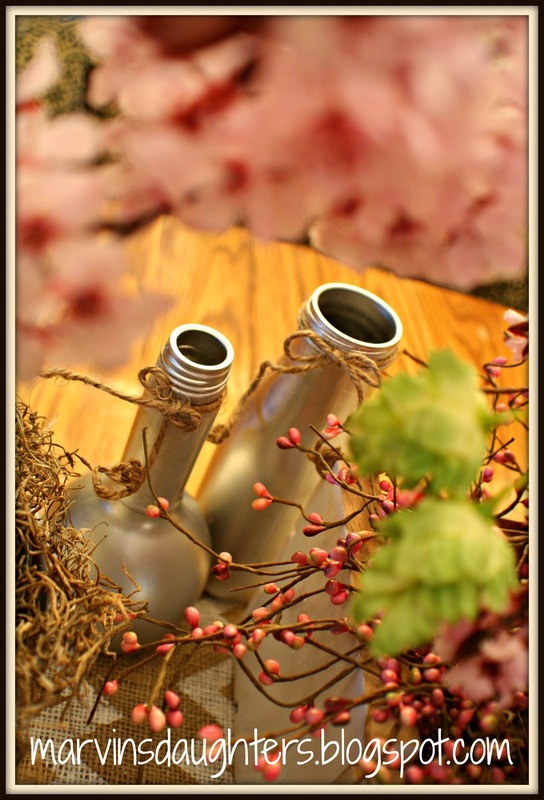 Upcycling at its best! 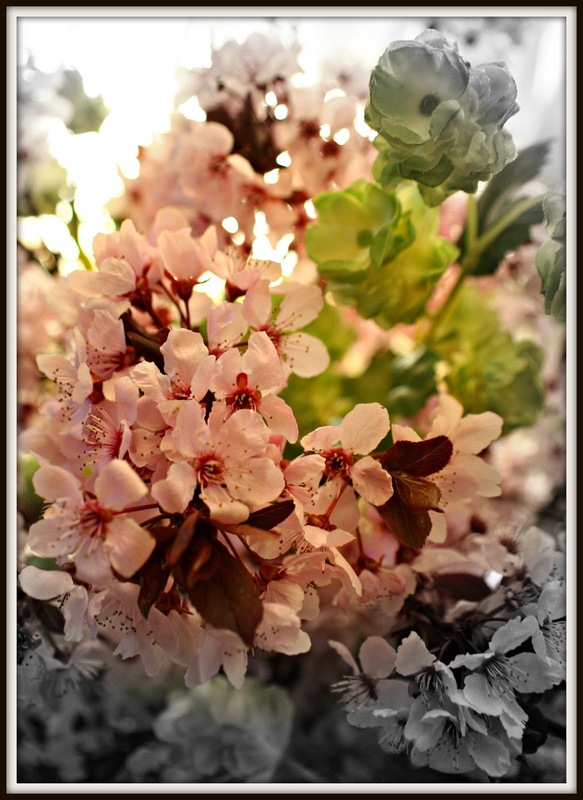 My friend Paula has two flowering plum trees in full bloom right outside of her front door. I "trimmed" three branches for her and brought them home to bring some spring inside. Thank you Paula, I don't think you could have bought me prettier flower!! 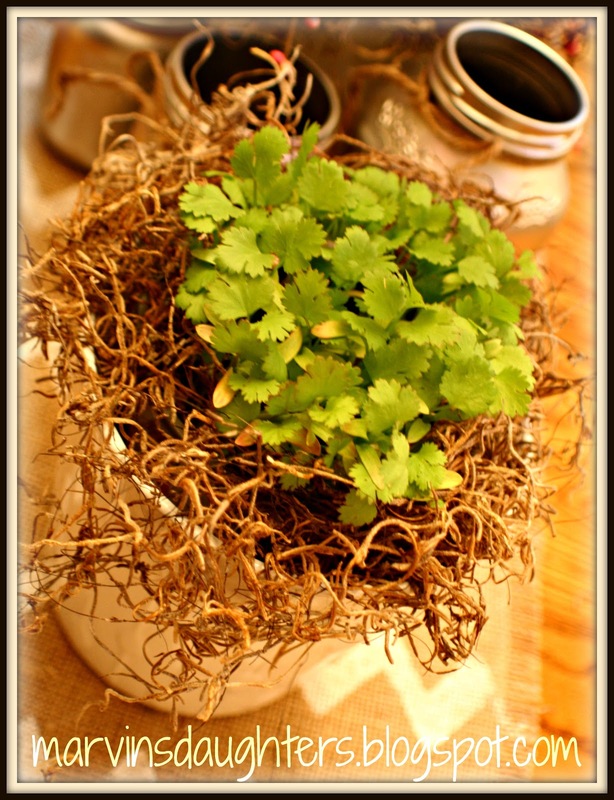 You might remember from my previous Springtime Mantel post when I mentioned that more seedlings where on the grow, well here they are, below is some cilantro and the next photo after the cilantro is some basil. I love trimming some fresh herbs when I cook. I am always using basil, cilantro and rosemary. 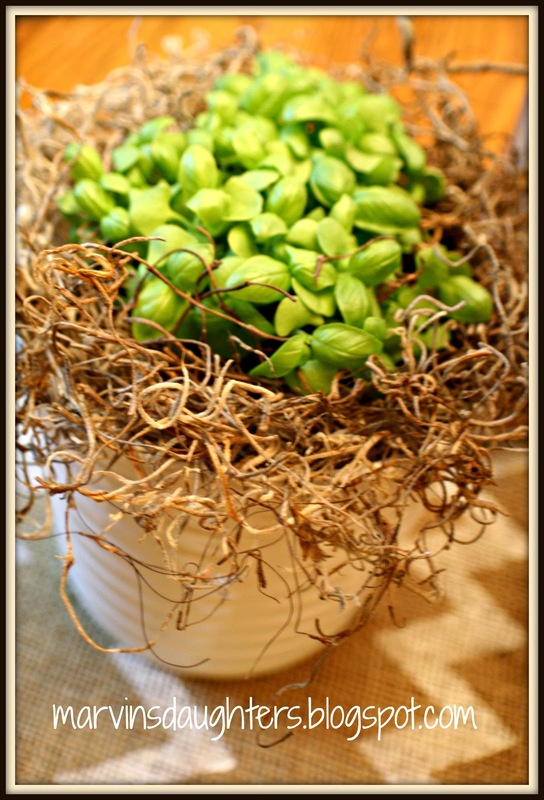 These little pots are perfect for the window sill. You don't have to grow herbs from seed, you can find them already started at most garden shops right now. Just pop them in a cute pot! I love these white ceramic Ikea pots. Yes I am getting more use out of the burlap chevron table runner. 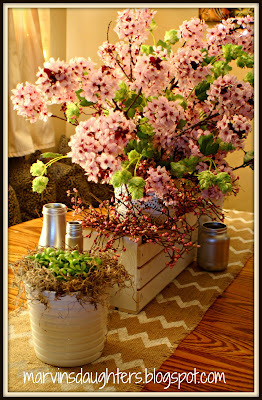 I am also re-using the wood CD crate that I used for my Easter centerpiece. Below are some glass jars that I spray painted chrome. I spray them at Christmas but never had a place for them until now. 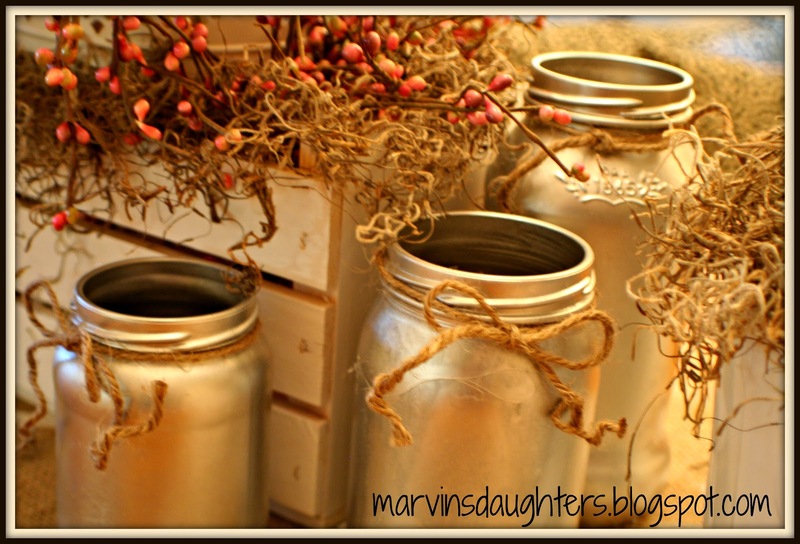 I tied some twine around the top of the jars, just wanted to keep it simple. In the picture below are some spray painted bottles. Confession time....I have a table in our garage full of things I want to spray paint!! Another thing my husband loves about me!! 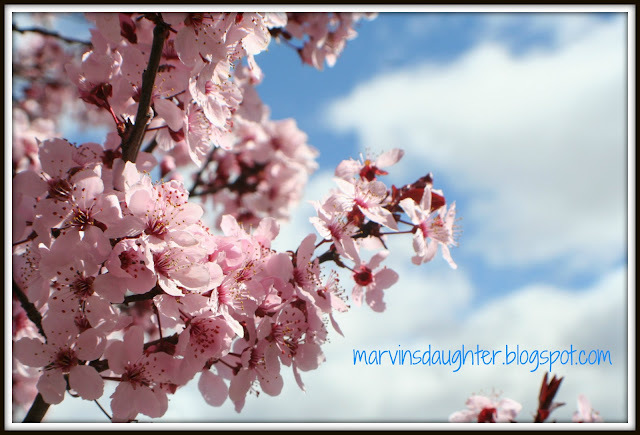 Almost every flowering tree in our area is in bloom. A week of clear blue skies ahead of us, I couldn't be more thankful. 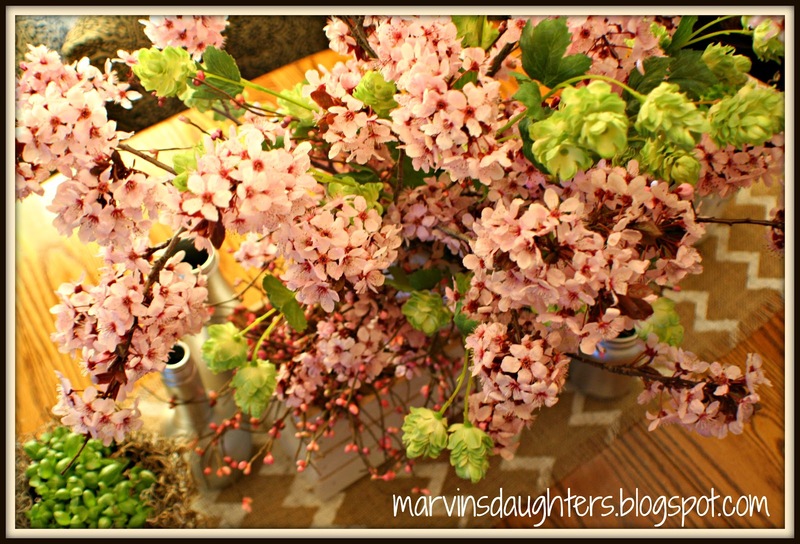 Just a few branches of blooms brought some spring inside our home. And yes it would have to be silk flowers for those of you who suffer from allergies! 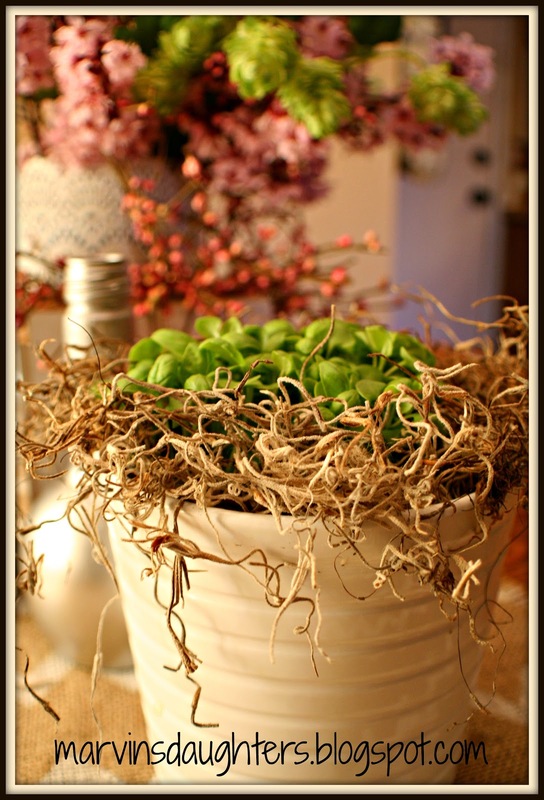 It can be a fun challenge to look at items around your home and use them in a new way or just move them to a different area. Or create a new grouping of things. OK you get the idea. Are you enjoying spring, or still waiting for it? Or are you closing in on summer? I hope your visit today inspired you to bring some springtime inside! 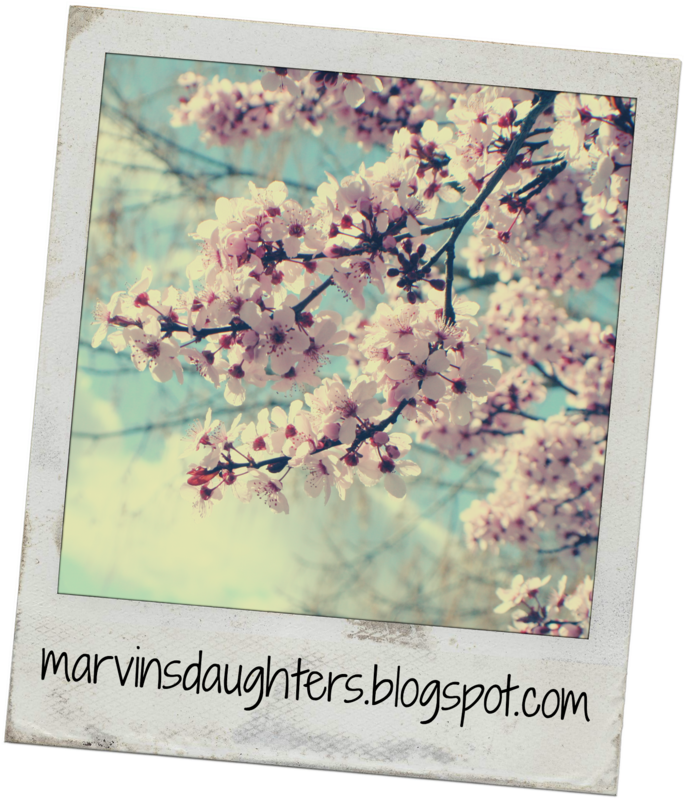 Follow and join my blog at the top right of this page, thank you! Such a beautiful centerpiece! 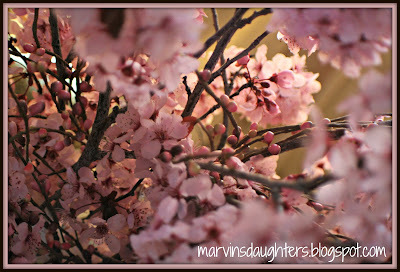 There is nothing more beautiful than flowering tree branches. Spring has finally sprung, where I live. Oh the beauty of it all! Gorgeous. 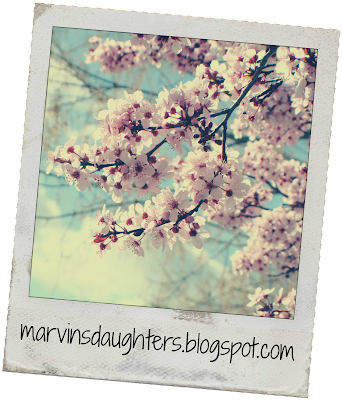 I love all the inspiration! It says spring is coming and I love it! 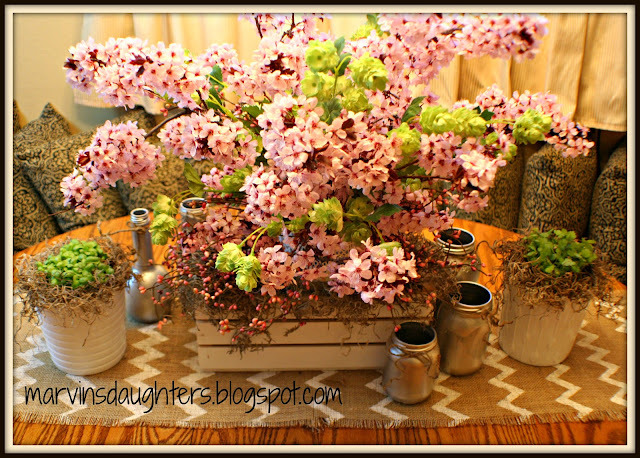 Love the floers, love the table runner. 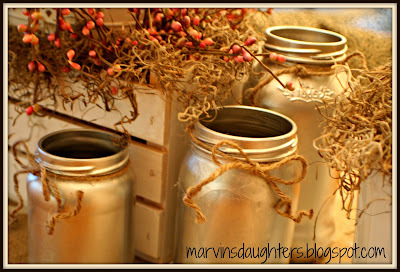 what a lovely arrangement, and I love the sprayed jars! Thank you for sharing it at to What We Accomplished Wednesdays. Have a lovely week! 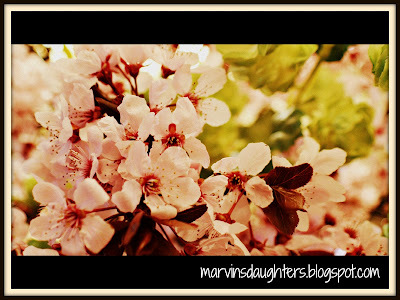 Love the trees in bloom! Your pictures look great; awesome editing pulling out some of the color. You rock! Thanks for stopping by:) I just adore that centerpiece and the whole table scape is beautiful. I too love bringing the outside in. 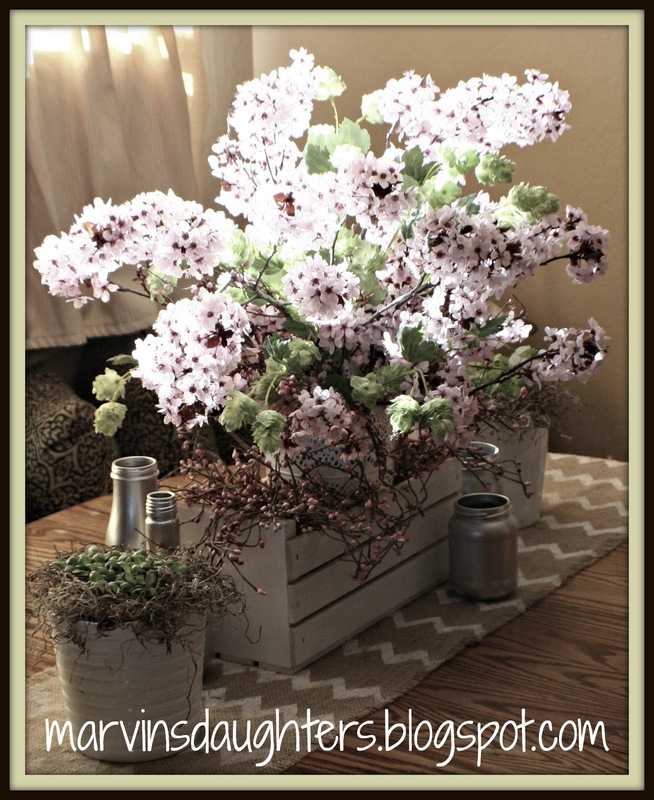 Really beautiful, thanks for sharing at Restyled Sundays.